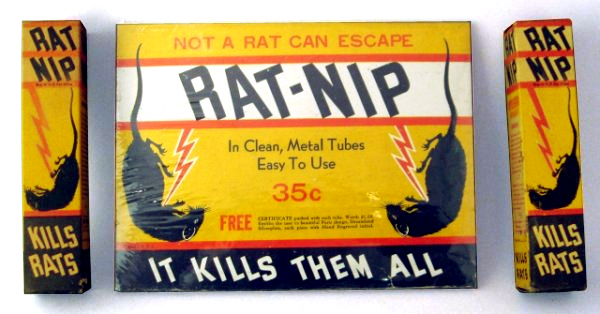 Following yesterday’s thread about rodenticide manufacturers alluding to pets, I thought “Rat-Nip” an insidiously playful name. In 1908 The Futon Chemical Company registered the trademark for RATNIP on the left. 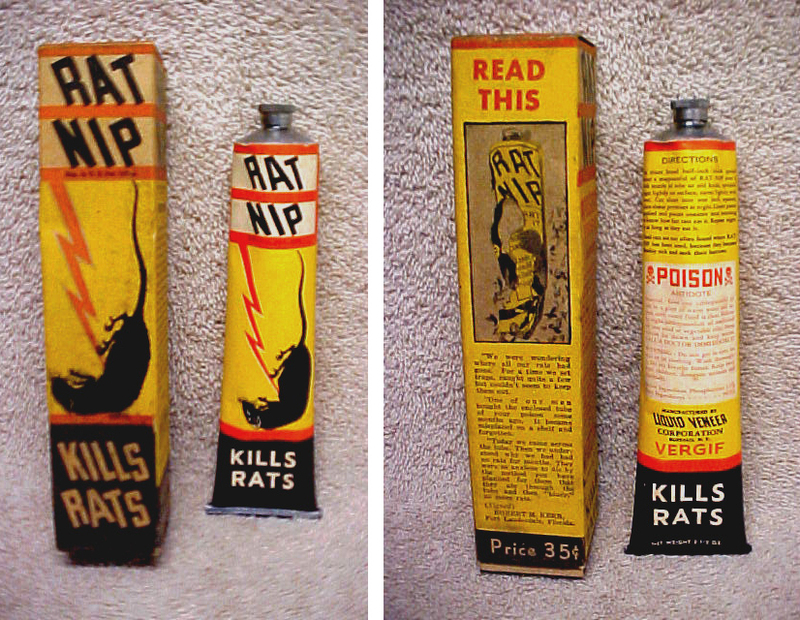 In 1923 NIP-CO Manufacturing, Inc. registered the trademark for RAT NIP on the right. Both are trademarks for a rat poison, but I can’t tell for sure whether they are the same product rebranded or confusingly similar trademarked product names. I haven’t been able to find any packaging or advertising with this hand-lettered version of the logo, but, given that the back-slanting, sans-serif logo (on right) wasn’t even registered until 1923, I’m guessing there may be some bottles or jars out there with the hand-lettered logo. All of the packaging that I’ve found so far—(like the box on right from ChangoBlanco’s Flickr Photostream)—uses the 1923 trademark. When I first saw the back-slanting Rat-Nip logo I figured it was from the 1940s or 50s and that the wacky backward leaning type was meant to imply knocking rats over backwards—corresponding to the upside down victim in the illustration with the lighting bolt. But another name that appears on the back of some Rat-Nip packages is The Liquid Veneer Company. “Liquid Veneer” was a furniture polish and their trademark, registered in 1906, is strikingly similar to the back-slanting Rat-Nip logo. In fact, if you take a look at the early “Liquid Veneer” package design—also red, yellow & black; also with a back-slanting logo—it starts to look as if Rat-Nip’s packaging was designed in the “house style” of Liquid Veneer. Rat Nip was made and sold by Buffalo Specialty Company of Buffalo, NY USA, which later became the Liquid Veneer Corporation in late 1926. Originally named Buffalo Specialty Manufacturing Corporation, the firm was founded in 1885 by the larger-than-life Oliver Cabana, Jr. 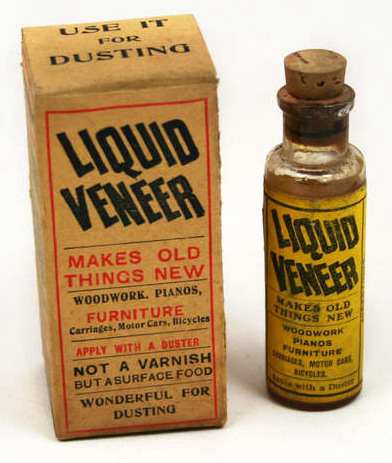 In the 19-teens the firm found its true calling when it bought the rights to a unique liquid furniture which it decided to call Liquid Veneer. That name was applied to many different types of cleaners, polishes, mops, and waxes. It’s unknown why Mr. Cabana decided on the unique backward-slanting sans-serif font (perhaps better called a reverse-italic?) 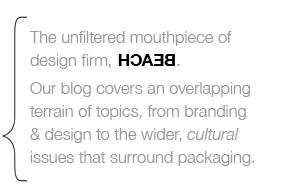 for the firm’s products, but it was a universal type used in all their advertising and on their product packaging. Mr. Cabana was a personal friend of President Franklin D. Roosevelt, and you can watch a short video of FDR at Cabana’s Elma NY retreat circa 1929 on YouTube. There’s a new-sih book out “Where They Truly Champions” about cheating on certified milking tests at Cabana’s Elma NY Farm Retreat. Mr. Cabana was associated with 35 different firms, mostly manufacturing, and many he founded or co-founded. He also was part owner of a gold mine in Ontario, Canada, and founded the Sun diet Sanitorium (sic) in East Aurora, NY. he was a remarkable individual, and this writer hopes to write a short book about Cabana sometime in the next 8-10 years. Thanks for reading my post!